A popular cosmetic dental procedure often performed by our dentist in Las Vegas, teeth whitening is an affordable way to improve the appearance of your teeth and brighten your smile. 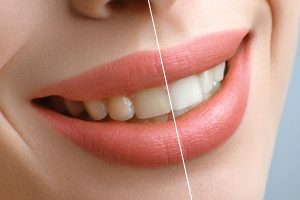 While the terms “whitening” and “bleaching” are often used synonymously, according to the FDA, the word “bleaching” is permitted on products that can whiten teeth lighter than their natural color. Products that contain active ingredients such as hydrogen peroxide or carbamide peroxide do “bleach” the teeth and can significantly lighten their color. Because whitening has a more pleasant ring to it, most products that could be considered bleaching products are labeled as teeth whitening products. Cleansing agents such as mouthwashes and toothpastes remove stains and debris from the tooth’s surface, thereby “whitening” it. Food and drinks like tea, coffee and red wine can discolor your teeth daily, and using these whitening products with an electric toothbrush can help remove surface stains, whitening your teeth and make the effects of professional whitening treatment last longer. Your dentist in Las Vegas can help you determine which whitening options will best fit your desired results and budget. While over-the-counter whitening kits are cheap, these types of products can be messy, take a long time to work and will only brighten your teeth a few shades. Take-home whitening trays are custom-made by your dentist and fit your teeth precisely. A professional-grade peroxide gel is applied and trays are worn overnight or for about an hour a day for a few weeks, depending on desired results. Because they are custom-crafted, this gel doesn’t have the tendency to seep onto gums and other delicate tissues of the mouth like it can with over-the-counter whitening kits. In-office procedures such as BioLase Laser Whitening offers the most dramatic whitening effects in the least amount of time. Your dentist will ensure that the gums and mouth are protected, and apply a high-concentration peroxide gel to your teeth that may be used in conjunction with a special laser. This easy, non-invasive procedure takes about an hour and can make your teeth up to eight shades whiter. Our skilled dentist in Las Vegas can help you brighten and enhance your smile with whitening and other cosmetic dental procedures such as veneers, crowns, implants, and more. We look forward to serving all of your dental health needs. Call us at 702-869-0032 to schedule your appointment today!